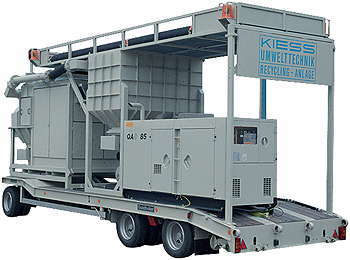 KIESS began as early as 1978 to develop mobile and stationery recycling systems and thereby put particular value on cleaning systems for the abrasives. Since quartz sand as one-way medium has been forbidden in Germany, (also for the prevention of silicosis) copper slag or coal slag is used today. Correct disposal of this one-way blasting medium costs about ten times the purchase price of the slag itself. We have developed and patented systems which remove toxic paint components, e.g. red lead with such efficiency that the circulating abrasives can be re-used without any danger to people or the environment. Reasons for using recycled sand blasting media.